Okay, time to be serious! Below we've discussed some reasons of why Furnace makes noise. When we say maintenance! maintenance! maintenance! we say it for your better. Maintenance services will cost you some dollars but will sure save you from unhappy accidents. If you've had an HVAC service provider do the maintenance of your Furnace, you must have seen him cleaning the burner. 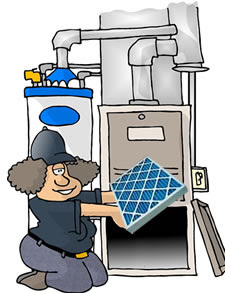 Cleaning of the burner is more crucial than cleaning the Furnace filters. 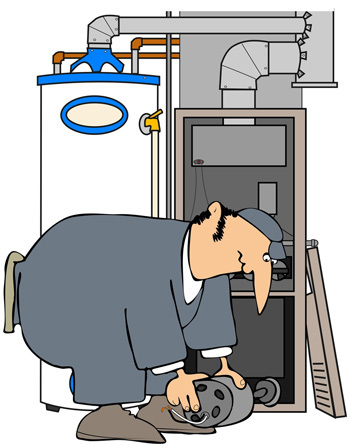 One major reason of Furnace noises is a dirty burner. As the burner gets dirtier and dirtier it takes more time to ignite. Delaying ignition forms gas clouds. And when the ignition takes places, an excess of gas causes boom boom sounds. Oh sorry, not boom boom, something like bhraam bhraam. So if you don't feel like singing over this sound, take a soft brush, turn off Furnace connections and clean your burner else try to set up some space in your budget for a new furnace because the dirty burner may later affect the heat exchanger. And once the heat exchanger is gone, you'll have to buy a new Furnace. And you're in no mood to do that we know. So, clean the burner! Take your ear closer to the Furnace. Hearing any sound? Yes, but that doesn't seem to come from the Furnace itself. Congratulations! Your Furnace is an innocent Furnace. But your ducts aren't! If the noise is coming not from the Furnace then it is probably coming from the ductwork. As the air blows through the Ducts, its parts may face contraction and expansion. The unusual noisy contraction and expansion occur due to improper setup of the ducts or maybe due to undersized ducts compared with the system. So if the noise is keeping you up all night, better call your HVAC service provider to fix that. Or, if you're okay with the sounds, better record it and send it to us. Let us hear how musical is your Ductwork. And after all, things come back to the Filters. Julia A Carney in her renowned poem Little Things emphasized on the importance of little things. If you never read that, google it but later and for now, understand that little things do matter. Cleaning of filters hardly requires 10 minutes. Such a little, little, little thing to do but this same little thing if ignored can cause mighty problems such as causing freakish furnace noises that make you think of the Furnace accidents you read in the newspaper last month. Frightening? Certainly! Then please clean the clogged smogged, fogged dirty, yukhhh Filters. If your Furnace is making noise and you're still unable to figure out what went wrong with it, faint not! Scroll up and find our number. Call us now and get your Furnace screwed up today. Did you eat enough today? The sound could be coming from your tummy. Just wondering!